For adapting a standard tie into one that can accept 1/2” coil rod. For tying formwork into an existing wall or structure. What is ONE-SIDED and BLIND SIDED forming? One-sided forming is the practice of pouring a concrete wall up against an existing wall. The trouble is securing your formwork to the existing wall, and in the past this has been achieved with heavy and expensive external backbracing. Steel Dog has revolutionized the world of One-sided and Blind Sided forming with solutions that eliminate the need for external bracing. 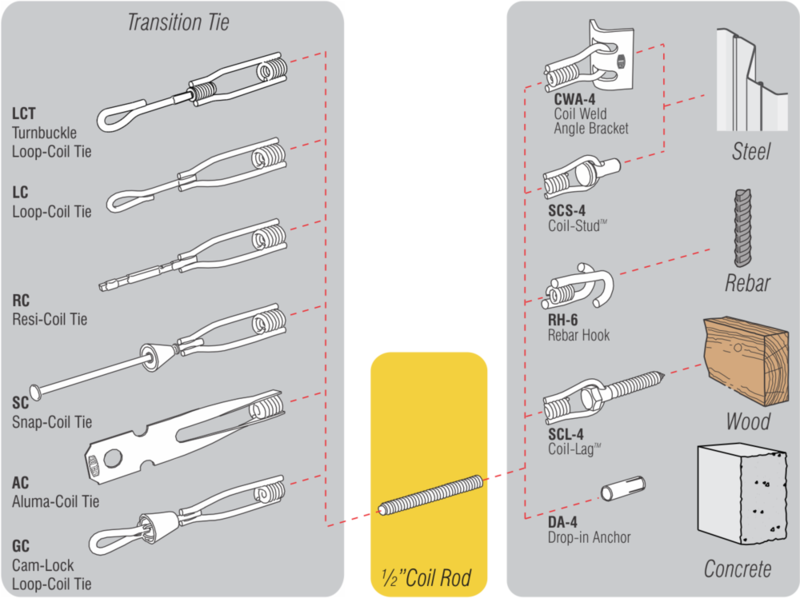 Our comprehensive system is based on making universal connections to coil rod using a "Transition Coil Tie." We make these Transition Ties™ for most major form systems including Steel Ply Forms, Aluminum Forms, 1-1/8" Wood Forms, Gates Cam-Lock forms, and Job Built 3/4" ply Forms. Beyond that we’ve developed a series of parts to tie into almost any existing wall, be it concrete, steel, wood, rebar, you name it we’ll help you form to it.